In the inital phase of work, 10 steam boilers were upgraded at six Advocate sites: Christ Medical Center, Condell Medical Center, Good Samaritan Hospital, Good Shepherd Hospital, Illinois Masonic Medical Center, and Trinity Hospital. Boilers were retrofitted with new burners pre-purchased by Advocate, according to installation specs created by G/BA. The boilers previously had mechanical linkages controlling the rate of combustion, which limited ability to turn down the firing rate. The new burners are capable of a 10 to 1 turndown, replacing existing burners that, in most cases, were capable of only 4 to 1 at best. The burners use electronic controls in conjunction with VFDs to optimize combustion. The eight largest boilers also incorporate oxygen trim controls. The project has improved reliability at all sites, while maintaining N+1 redundancy. Operational costs were reduced by more than $522,000 a year, and utility incentives totalling nearly $831,000 (from four different utilities) helped fund the capital costs. The next phase built on these upgrades at five of the same facilities (Christ, Condell, Good Samaritan, Good Shepherd, and Illinois Masonic) as well as Advocate BroMenn Medical Center. Nine steam boilers at these six sites were retrofitted with boiler flue stack economizers, domestic hot water preheaters, and dearator tank vent condensers. The components are designed to recover waste heat from the hospitals' steam boiler systems. These upgrades are projected to reduce the boilers' consumption of natural gas by more than 290,000 therms per year. G/BA performed energy studies at each of the hospitals to identify energy-saving projects. 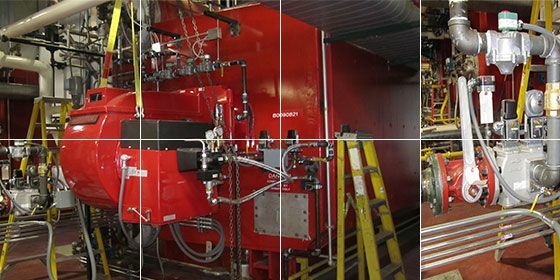 Advocate was able to prioritize burner replacements at six of its 11 facilities in this manner; by addressing the replacement as a single capital project, Advocate was able to ensure funding for all high-priority sites. Advocate pre-purchased the burners directly from the manufacturer before bidding the installation portion of the project. This choice involved several advantages: discounted equipment pricing, faster equipment delivery from the supplier in Germany, burner sourcing ensured from the preferred manufacturer, and competitive bidding on installation services because contractor equipment markup was reduced. Purchasing equipment first and then bidding the project with G/ BA’s installation specification saved Advocate $185,965 compared with a conventional turn-key proposal. Utility incentive applications were streamlined by the equipment pre-purchase and by aggregating multiple facilities in each service territory. Overall, natural gas incentives paid for half of the total project cost, including installation and engineering. Electrical incentives covered an additional 1.2% of the total project cost. The simple payback was 1.51 years after considering the incentives. The project reduced the boilers’ natural gas use and combustion through energy efficiency improvements, and lowered emissions rates of pollutants per unit of natural gas. Primary heat recovery is provided by boiler flue stack economizers, used to preheat boiler feedwater entering the boiler steam drum. Typical performance provides for 20 to 25°F preheating of the feedwater, reducing the amount of natural gas required for steam production. Economizers were custom designed for each site to allow installation in challenging existing spaces. To reduce potential issues with operation and maintenance, the design incorporated all-stainless-steel construction of the stack economizer tubes and flue gas enclosure. An internal bypass damper and temperature controls ensure that the flue gas is maintained at a high enough temperature to avoid condensation. Heat exchangers and controls for preheating domestic hot water allow utilization of the bypass steam of the flue economizer boiler feedwater. This unique design took advantage of the economizer bypass steam, which is normally returned to the condensate tank, resulting in wasted flash steam. Vent condensers were installed at the dearator tank bleed vents to recover waste steam and preheat make-up water to the condensate surge tanks. Overall, natural gas incentives from local utilities are projected to pay for 17% of the total project construction cost. Simple payback is projected at 8.2 years after considering the utility incentives. Advocate’s operational costs are expected to fall by a combined total of $184,000 per year through increased plant efficiency and reduced gas consumption.